Each day in the U.S. millions of pounds of adulterated pet foods are sold to unknowing consumers; an estimated $19 Million dollars worth every single day. Laws that govern pet food/animal feed have been ignored for so long, it’s so bad – so big – it is probably too late for anything other than a warning. The American Pet Products Association states in 2015 $23 billion worth of pet food was sold in the U.S. An estimated 30% of those sales were for pet food and treats that legally should not have been sold. Should not have been sold because federal and state law define their ingredients as adulterated. There are many laws governing pet food sold in the U.S. However these laws are of no benefit to consumers if they are not enforced. Consumer advocates Susan Thixton, Mollie Morrissette, Dr. Jean Hofve, Dr. Cathy Alinovi and Nina Wolf took a close look into state and federal law (governing pet food). We found lack of enforcement of pet food law to be so big, involving so many different pet foods and treats – that it is close to impossible to turn back now. In the United States Code (law), Title 21, Chapter 9, Subchapter IV, Section 342 (The Federal Food, Drug and Cosmetic Act) – the law states that a food (food would include animal/pet food) is considered adulterated if it is sourced from a non-slaughtered animal (Section 342 a-5). This law is in place to protect consumers and their pets from the risk to consuming diseased or decomposing animal tissues. 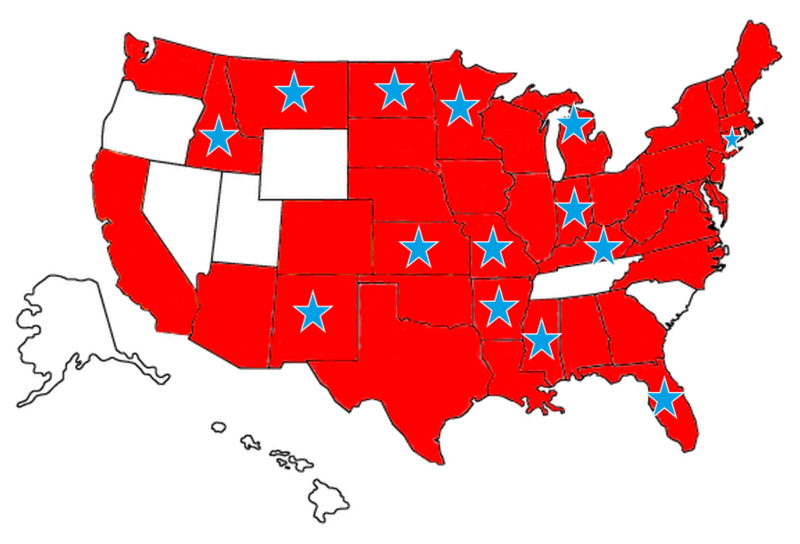 Below is a map of the U.S. regarding enforcement of the above federal law. 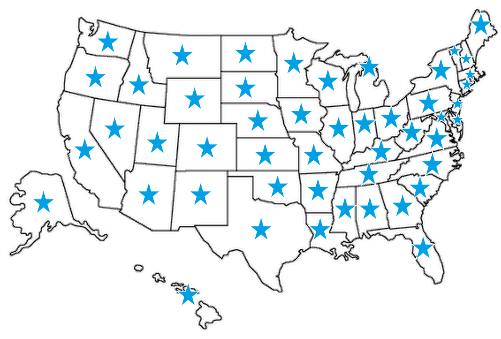 The states with stars (all of them) are states that do not enforce the above law with pet food. With research into State laws, we found that 14 States had the exact same law – clearly defining within state law a pet food as adulterated if it contains any part of a non-slaughtered animal. 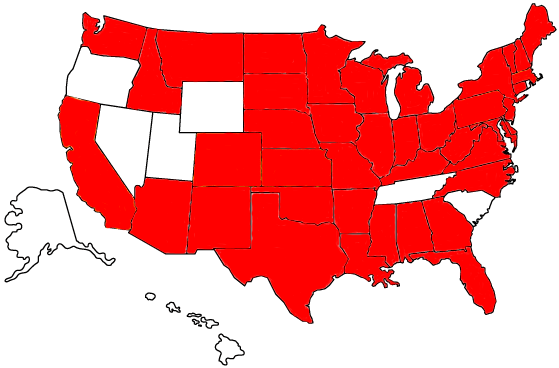 The following states are not only ignoring the above federal law, they are ignoring their own state law too: Arkansas, Connecticut, Florida, Idaho, Indiana, Kansas, Kentucky, Michigan, Minnesota, Mississippi, Missouri, Montana, New Mexico, and North Dakota. How do we know that states are ignoring federal and state law? We know – because of the legal definition of seven commonly used ingredients in pet food. Pet food ingredient definitions are quite specific. The concern with federal and state law enforcement is the legal requirement – within the pet food ingredient definition – to whether it is required or not required to be sourced from a slaughtered animal. Pet food ingredients sourced from a slaughtered animal would be legal (per federal and state law). Pet food ingredients sourced from a non-slaughtered animal would not be legal (per federal and state law). Examples of non-slaughtered animals we know with certainty are allowed to be included in the pet food ingredients listed below – are livestock animals that have died in the field and spent laying hens. At the AAFCO meeting in August 2015, all consumer advocates in attendance (Susan Thixton, Mollie Morrissette, Dr. Jean Hofve, Nina Wolf, Dr. Cathy Alinovi, Dr. Karen Becker, Dr. Judy Morgan, BC Henchen and Rodney Habib) were witness to the discussion of non-slaughtered spent laying hens ground whole – feathers, feet, feces and all – becoming the pet food ingredients chicken/poultry by-products and chicken/poultry by-product meal. Below is a chart of some (not all) commonly used pet food meat/animal protein ingredients. 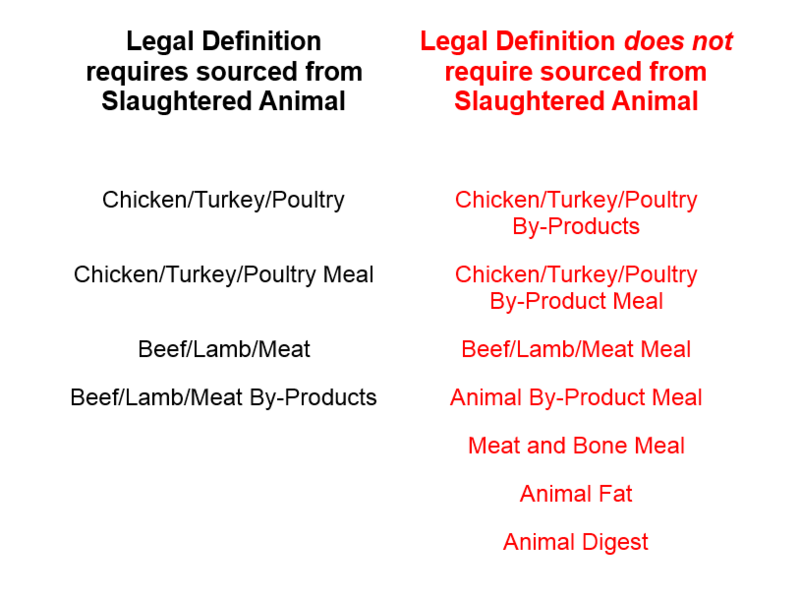 Per their legal definition they are listed in a column that requires them to be sourced from a slaughtered animal (black), or listed in a column that does not require them to be sourced from a slaughtered animal (red). Red/non-slaughtered animal material ingredients are considered adulterated per federal law and state law in 14 states. We are not stating that every pet food that uses one of the above ingredients is sourcing from an illegal non-slaughtered animal. That is part of the problem – pet food consumers are not told who is sourcing from adulterated/illegal non-slaughtered animals and who isn’t. All we know with certainty is what the legal requirement of the ingredient is – if the ingredient definition requires the animal source to be a slaughtered animal or if the ingredient definition does not require the animal source to be slaughtered. BUT…in every grocery store, every big box retail store, every big box pet food store in Florida are pet foods that contain ingredients that can be sourced from a non-slaughtered animal. As example: Beneful Dog Food. Beneful Dog Food (original, chicken recipe) contains three ingredients whose legal definition allows them to be sourced from non-slaughtered animals; chicken by-product meal, animal fat and animal digest. Instead of enforcing federal law and enforcing state law, Florida is allowing this pet food and perhaps thousands of other pet products to contain non-slaughtered animal ingredients – with no concern to the consumer purchasing the pet food or the pet consuming it. 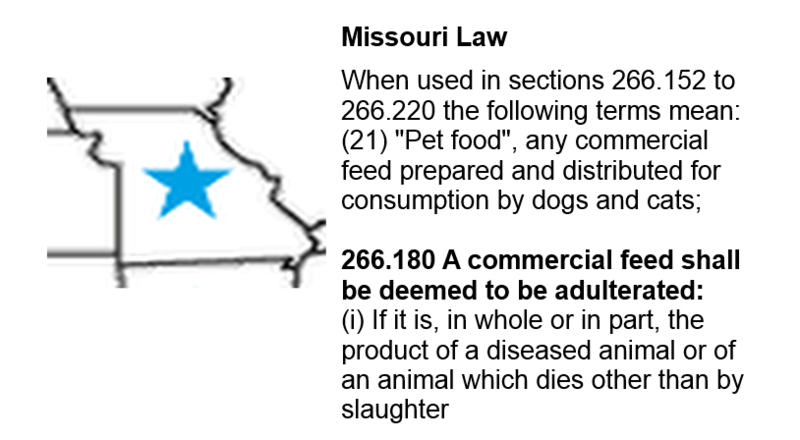 But…in every grocery store, every big box retail store, every big box pet food store in Missouri are pet foods that contain ingredients that can be sourced from a non-slaughtered animal. As example: Meow Mix Cat Food. Meow Mix Cat Food contains four ingredients whose legal definition allows them to be sourced from non-slaughtered animals; chicken by-product meal, animal fat, animal digest and turkey by-product meal. Instead of enforcing federal law and enforcing state law, Missouri is allowing this pet food and perhaps thousands of other pet products to contain adulterated ingredients – with no concern to the consumer purchasing the pet food or the pet consuming it. How can this be? How can so many commonly used pet food/treat ingredients included in thousands of pet products be considered adulterated/illegal per federal and state law? We tried asking, but our questions went unanswered. Before I get to that…there’s more law being ignored. In the same United States Code (law), Section 343 defines a food whose labeling is false or misleading in ANY manner to be misbranded. A misbranded pet food would be illegal. Again, this federal law is in place to protect consumers and their pets. 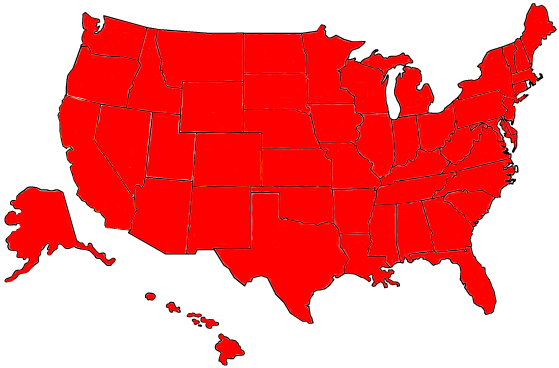 The following image shows in red the states (all of them) that do not enforce the above federal law with pet food. We found 42 states had very similar misleading labeling laws as the federal law. Most states had law that declared a pet food adulterated if an image on the label reflects a quality different from what is in the pet food. Example: if grilled chicken was shown on the label, and the pet food is not made from grilled chicken – that pet food should be declared adulterated because its label reflects a quality different than the pet food. 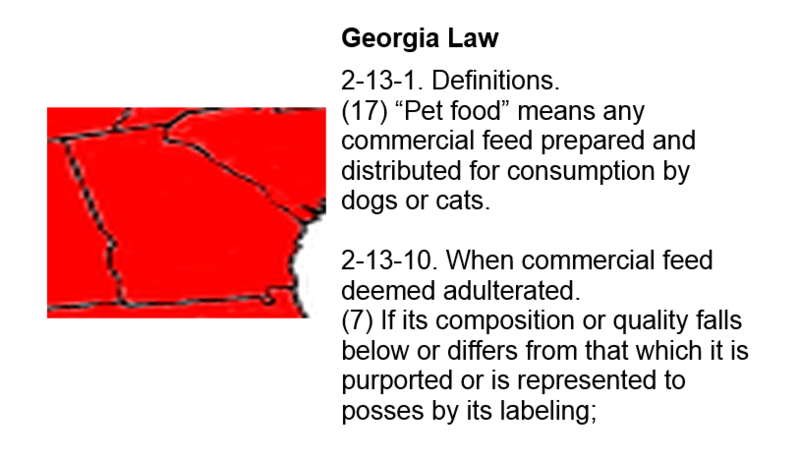 In the following graphic, red indicates state labeling laws specific to pet food ignored. BUT…in every grocery store, every big box retail store, every big box pet food store in Georgia is (as example) varieties from Pedigree Dog Food, Hill’s Science Diet Crafted Pet Food, and FreshPet Pet Food. Varieties of these pet foods show grilled meat or roasted meat on the label, but there is no grilled or roasted meat in the pet food. The ‘quality’ of the pet food falls below what is ‘represented on the label’. Instead of enforcing federal and state labeling law, Georgia is allowing these pet foods and hundreds of others to display misleading images on the label – with no concern to the consumer purchasing the pet food or the pet consuming it. How can this be happening? How can so many states ignore their own state law allowing thousands of pet food and treat products to be adulterated? We asked two states, but they did not respond. An email was sent to Florida Department of Agriculture on February 15, 2016 asking why state law is not being enforced with pet food. On Tuesday February 16, 2016 a follow up phone call was made to FL Department of Agriculture – message left. To date, no response has been received. An email was sent to Missouri Department of Agriculture on February 17, 2016 asking why state law is not being enforced with pet food. A Missouri Department of Agriculture representative is the co-chair of AAFCO’s pet food committee, we thought certainly this person could provide us with information…an explanation. To date, no response has been received. Assumption: they cannot respond because they would have to admit their own state laws are not being enforced. They can’t tell us why, they can’t tell us anything – it would be very incriminating if they did. The FDA website tells us that most states have adopted the federal laws we have discussed above. Click Here to view. This FDA webpage also tells us that most states have adopted full federal law as state law, but not all. Without the aid of a legal genius, it’s challenging to determine which states follow all federal law. 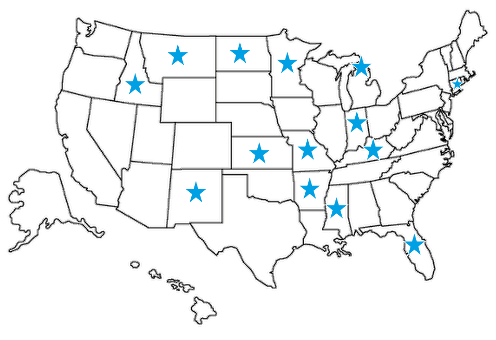 What we are certain of, the red states in the graphic below are ignoring their own state pet food labeling laws – and the starred states are ignoring their own state law allowing adulterated ingredient pet foods to be sold to unknowing consumers. Question. Why do all of you and I have to abide by law, and federal/state agencies do not? Specific to the state and federal law that requires all pet food ingredients to be sourced from slaughtered animals, because state and federal authorities have ignored enforcement for so long, the ‘problem’ has grown to an estimated 30% of all pet foods and treats now contain an adulterated (non-slaughtered animal) ingredient. It is impossible at this point – to swiftly remove or recall all of the adulterated pet foods and treats. The problem is out of control. Though it is what all pet food consumers (and their pets) deserve, this cannot change in an instant. We must consider that many, many families can only afford this type of pet food. We must consider too that animal shelters can only afford the cheapest of pet foods – which are most likely to contain one of the non-slaughtered animal/illegal ingredients. It is not our goal to financially damage a family, a shelter, the pet food industry or the pet food ingredient supplier industry just because regulatory authorities have not enforced law. The only thing to do at this point – is to require pet foods that include an ingredient allowed to contain a non-slaughtered animal to place a warning on the label. And this warning needs to be implemented immediately. This is – at the very least – what pet food regulatory authorities can do to protect unknowing consumers. We ask authorities to require all pet foods/treats with ingredients whose definition does not require it to be sourced from a slaughtered animal (a violation of federal and state law) to include a warning on the label. Example warning label: ‘Warning. This pet food could contain ingredients that are in violation of federal and state law. Handle and store with care.’ The consumer warning should be required to be implemented immediately, and placed in a highly visible area on the pet food label. We ask authorities to enforce federal and state labeling laws, making certain that a pet food displaying grilled meat on the label actually contains grilled meat. We have provided pet food consumers with the laws of each state for these issues. And we have provided an example letter for your representatives in Congress and your State Attorney General specific to the laws in each state. Please click on the link below to your state – send your emails. Please share this post asking every single pet food owner to do the same. A warning notice on these pet foods is the VERY LEAST thing that authorities should do for pet food consumers. But they won’t do it on their own – we must ask. For years now, I have dumped brand after brand of pet food (and I started with what was then the best!) after quality declined, companies merged or were sold, or companies became less transparent. For over 5 years I have taught customers how to choose among the bewildering array of commercial foods, and how to make their own pet food. I’ve taught at my own store, other local business venues, the local community college, and in customers’ homes. I have come to see the absolute necessity of linking up our movement for safe and nutritious pet food with the natural health movement, the organic and regenerative agricultural movement, organic gardening and natural/pasture raised meat producers, and the reformers who would retool and then enforce meaningful food (and pet food) safety laws that do not punish small producers in the interest of Big Ag, Big Food and Big Pharma. There are potential linkages that need to be made so that we can return to sanity and save the planet from corporate excess and intransigence. We have decided to launch an online course to reach a much broader audience wanting to know how to feed their families, including the furry members, using whole, locally sourced, organic and humanely raised ingredients. It is critical to support your work, Susan, in exposing and prodding and standing up for consumers’ interests — but big reforms are not likely at the highest levels any time soon. It really remains for each of us to learn and take charge of our own and our pets’ food. The information is increasingly out there. But we are foolish if we wait for any of the commercial or government interests to do it for us. I believe we can make the Warning on the pet food label happen. I think it is a must to happen in order to reach the millions of consumers out there that do not know regulatory authorities are not enforcing law. I can’t give up – I think we can do this. We have a few human food safety NGOs that report about the pet food and animal feed issues on a fairly regular basis: Cornocopia Institute, Food & Water Watch, Food Animal Concerns Trust and Bill Marler’s Food Safety News for example. Yet, there is no other organization whose focus is entirely on pet food, with the exception of The Association for the Truth in Pet Food. Therefore, it is vital that other sectors in animal food get involved, such as veterinary nutritionists, holistic vets, animal centers in universities, attorneys whose focus is on food law, and independent pet food manufacturers, for example. Remarkably, there are still only three pet food safety advocates in the U.S. that meet with AAFCO. Why others don’t want to get involved is probably due to the crushing sense of hopelessness of fighting a regulatory institution so deeply entrenched in protecting the business interests they govern. Because, as long as animals have been fed commercial feed, the laws protecting those animals has been largely ignored in favor of economic and political interests. When outsiders encounter the absurdities in the industry, I believe they are overwhelmed when faced with enormity of the problem. Change only comes about when enough consumers refuse to participate in supporting an industry that depends entirely on profiting from selling pet food and animal feed made from the waste stream in the human food industry. And change is occurring, much more rapidly than any of us expected. It is through education, activism, and exposure that the atrocities in the pet food industry will gradually come to an end – or face steep economic losses and public disgrace. It is with a simple, truthful label, that could change the entire pet food industry. Consumers deserve to be informed about the risks associated with the food they feed their beloved animals, in order to make informed choices for the safety of the members in their household. And we will get that warning label, just as with other foods that are required, by law, to label their foods with a warning statement to prevent consumers from becoming ill. It’s a matter of health – and to pet’s – it’s a matter of life. I agree with Susan, this will happen. …”We are not stating that every pet food that uses one of the above ingredients is sourcing from an illegal non-slaughtered animal. That is part of the problem – pet food consumers are not told who is sourcing from adulterated/illegal non-slaughtered animals and who isn’t.”…. The fact is that most pet food companies have no idea what the source is for the ingredients they are using and therefore couldn’t truthfully inform consumers if they wanted to. Sadder yet is the fact that those companies who make the component ingredients often have no qualms about lying, same as many of the cheap pet food companies. I once had a Nutro rep tell me corn gluten meal was an expensive, high quality source of protein. With a straight face. That’s what he was told in company training and that’s what he was regurgitating every pet store owner in his territory. When I asked “if its so expensive, why not just use real meat for protein?” he looked at me blankly. Why does this happen? For the same reason melamine was put into Chinese sourced rice protein powder – it was cheaper than using actual rice and impossible to detect without a specific test. As anyone who reads this website knows, testing doesn’t come cheap. Plus what do you test for? Who would have thought immoral profiteers would put melamine into food? The companies who purchased that rice protein had no clue it was contaminated. NOBODY was testing for melamine. And of course the Chinese knew that. As you pointed out Susan, the biggest risk – not the only risk but certainly the biggest – comes with cheap pet food. After the Great Pet Food Recall we all saw the increase in prices as companies improved their quality and high grade ingredients became scarce. It is a commodity market after all. As soon as these State & Federal Laws are enforced, prices will go up again. How will shelters and the economically challenged handle that? It seems a depressing no win situation. Cheap food for the masses or nutritious healthy food for those who can afford it. What a crappy choice to face. B, we do not want to take down the pfi or prevent animal shelters from being able to afford pet food – we just ask to keep consumers informed. A warning label is no more costly than the ink that’s used to print it. We don’t believe a cautionary statement will drive the pet food industry out of business or cause them to charge more money for those labeled foods. If anything, consumers will be glad for the transparency and those that are spending top dollar for that fancy pet food may find that, it too, is no better than the cheapo brands. And the foods that don’t require a warning statement, will have the gratitude and loyalty of an enduring customer base. First off Mollie, so sorry about your back. They are miserable things when not functioning properly. Second, I in no way insinuated that anyone was trying to “take down” the industry. Point of fact, it can’t be. I agree with most of the reforms that are being worked on by Susan, et. al. I’ve been advocating for holistic pet care before it was a buzz word and have little love for the sleazy animal parts industry or the pet food manufacturers that buy their products. The letter that I read for WV clearly asks two things of the AG and my Congressman: to enforce the law and require labeling for adulterated products. I was addressing the potential outfall of the first. Should the response from this website’s readers create enough concern, Attorneys General could start a major investigation. While this is great for exposing what all of us on this site know, the unintended consequences are higher prices and, because State agents can remove adulterated food from the shelves immediately, pet food shortages. Long term this would undoubtedly cause the pet food industry to change it’s formulas but would certainly not “take down” the industry. It will cause price increases unless companies put less meat and more grain in the food. Do I think AG’s will do this? Short term, no. All that is lacking is a single high profile advocate and things could take off. Look at what happened with “Super Size Me”. Over the years I’ve talked with holistic pet foods manufacturers who spoke at length the deception and slight of hand they dealt with in trying to produce a worthy food. More than one couldn’t remain in business because procuring the ingredients was so expensive that the price point lacked broad appeal. Part of that price was the huge amount of time these conscientious manufacturers spent vetting the mills and distributors – travel to inspect facilities, sample testing, background checks, being on site while their food was manufactured and so forth. 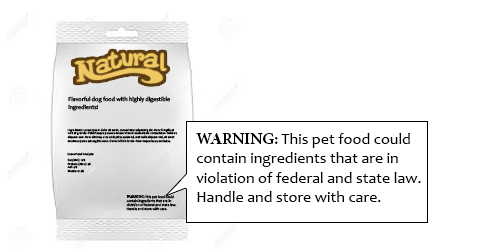 Further, consider this about a warning label: That label will be on all but a handful of the highest priced pet foods, thereby diluting it’s usefulness. Even “good” companies are going to slap that label on their product to cover themselves. They will do this because they know warning labels have marginal affect while a lawsuit could destroy the company. Companies also feel obliged to provide a stable supply of food to consumers and sometimes switch out ingredients if the primary source can’t deliver. Deceitful yes, but justifiable to some companies, usually those who produce cheap food. Think how stressed you get if the store is out of your preferred food. And consumers don’t care if the company itself was deceived. This is why you don’t see more names on Susan’s Pet Food Pledge. Smallish companies don’t want to get caught violating that Pledge or labeling because they were themselves mislead by a supplier. They can’t survive lawsuits or bad publicity the way Big Pet can. Big companies like Blue only get caught when they take a poke at an even bigger company. Or do they? A Bloomberg article from last July speculated that Blue founder Bill Bishop was executing a carefully crafted publicity campaign. Bishop certainly cut his teeth on other hated industries. From that article: “….He worked on Tareyton cigarettes (“I’d rather fight than switch”). Later he moved on to Ogilvy & Mather, Ted Bates, and then in-house with General Foods, where he promoted Kool-Aid and Tang. “Nice margins in artificial drinks,” he recalls.”….”. Big companies see any publicity as good and have the budget to survive short-term profit hits. They know the American consumer moves on to the next headline quickly. They’ll fight a warning label just like tobacco did, but have no problem putting one on because they know the downside is negligible. No, the price of a warning label isn’t consequential to the pet food industry. But they have a mixed track record of effectiveness. Studies that have been done on tobacco and alcohol warnings cannot separate out the effectiveness of labels from the accompanying public awareness campaigns. The pet food safety community has no public awareness campaign. Warning labels are so ubiquitous in our lives that we become immune to them. In effect, you have informed smokers/drinkers who believe they are the exception to the health consequences. Will a warning label change consumers’ buying habits? For a small percentage, yes. Small victories do add up and we’ll celebrate those victories. I will remain concerned however for the potential for collateral damage. You bring up some very good points. Obviously, you’ve thought a great deal about this and clearly understand the problem(s). The first problem: Will asking the states to follow the law have devastating and unintended consequences? Perhaps. However, we offer the government a simple solution: A disclosure statement. The problem is so pervasive, we do not anticipate (or even expect) any new wave of enforcement of adulterated/mislabeled pet foods. It is impractical and unrealistic to assume that the pet food/animal feed industry to reverse it’s way of functioning after decades of their dependence on the waste material that produces it. We have no expectations or illusions in that regard. However, we do believe a statement informing consumers of the risks, therefore providing consumers – who are interested in such matters – a choice. I believe, as with all advertisements and copy on packaging, its primary function is to inform consumers – it is not to influence their behavior – it is to allow them the freedom to make those choices for themselves. These disclosures are central to a consumer’s ability to decide what they want – or don’t want – to eat, smoke, chew, ingest, drink, or smear on their skin. Just as food is required to inform consumers about allergens, saturated fat contents, levels of alcohol, etc., they should be informed about the possibility of objectionable ingredients for the purposes of information. Cautionary statements may be ubiquitous, and be ignored by many, but there is a segment of the population that reads labels very carefully, and wouldn’t think of eating junk food any more than they would feed junk food to their pets. Our goal is a simple one: To give consumers the information they are being deprived of – whether that influences customer behavior is not a part of our agenda. If the pfi is worried that there will be an exodus of consumers that reject their products, they might consider offsetting that potential by offering products that do not contain illegal ingredients. As the pfi is well aware, the more consumers become aware of what is in their own food, will eventually translates to the pet food industry. As such, it is the largest growing segment of the pfi – high quality food for pets: Fresh, frozen, dehydrated, organic, and human-grade foods for pets are in high demand. Our request is one that reflects the current desires of our society. It’s time has come. Sorry for the long reply…now I have to go lay flat on my back! Wow Susan, what a great state by state resource! I will be contacting my legislators even if it is just a token gesture because they never listen to constituents unless it is accompanied by some kind of remuneration. Re: partnering with other movements, I do not believe partnering with the “natural health” and “organic” movements are a good idea because they are not science based, whereas Truth about Pet Food is. They are science based! And they are about empowering people to become less dependent on corporate interests which have subverted science over and over in pursuit of profits, supporting people’s right to know what they are purchasing and consuming. Your comment just gave me the idea of mailing in a “token” quarter with each request for the change. Perhaps a dollar bill would be better, since the quarters would be very heavy and may trigger security measures. However if suddenly there is a huge influx of regular mail with an enclosed dollar, it would be shocking if it did not make the news. I am not sure I am understanding the definition in the posting. When you say chicken/turkey/poultry-by-product meal does that mean chicken by product meal, turkey by product meal, poultry by product meal? Does chicken and chicken meal mean something else? Or does chicken as an ingredient mean from slaughtered animal? Is chicken meal from a slaughtered animal? Yes – chicken/turkey/poultry by-Product meal means chicken by-product meal, turkey by-product meal and poultry by-product meal. The legal definition is ‘poultry’ but the species source is required to be defined if just one species is used. And yes – chicken and chicken meal (poultry and poultry meal) legal requirement in the definition is to be sourced from a slaughtered animal. If I read the article correct it is saying that beef meal and lamb meal do not have to be from slaughtered animals? But chicken meal and turkey meal etc, does? Just making sure I understand it. So very stressful kibble is. That is correct – the legal definition of ‘meat meal’ does not have the requirement to be sourced from a slaughtered animal. We no longer feed pet kibble or canned pet food. Pet kibble food or canned food has all vitamins, nutrients and minerals are dead after the fast food processing, over cooking, and horrible ingredients. We buy raw from Steves Raw food, Raw Instinct or Primal Raw. OR buy raw at the grocery store, organic raw when we can find it. We also feed real banana slices, apple slices and frozen blue berries as treats. We feed fresh or frozen no salt green beans and some other fresh or frozen veggies. We also buy dehydrated real pet food to store for emergencies or for travel. We are looking to buy all natural, no chemical products. We no longer vaccinate at all. A vaccine lasts for over 20 years. Vaccinate more than that, you are putting your pet at risk for itching, allergies, illness, disease, thyroid problems, and cancer. There are pet health exemptions, one can buy from a real holistic vet, so you do not have to vaccinate your pet at all. Be a guardian angel for your pet. Learn yourself and research. Anything on TV, the news, are lies for profit. Veterinarians and human doctors sell everything for profit. We only use a vet for emergencies, a yearly blood test to test for any tick diseases, etc. We buy and keep on hand, Paxxin to treat parvo, because dogs and puppies get parvo from the parvo vaccine. We buy and keep on hand, Canine Distempaid to treat distemper, because puppies and dogs can get distemper from the distemper vaccine. We buy and use Tick Pathogen Nosode to help our dogs immune system against any tick diseases. We buy and keep Canine Nosodes, Parvo Nosode, Distemper Nosode, Rabies Nosode as a safe alternative to vaccines to prevent parvo, prevent distemper and prevents rabies. We buy the Terminator from WolfCreekRanch.com to keep on hand to kill off any tick diseases that can happen since we live in a tick infested area. The Terminator kills viruses, bacteria, and tick diseases and is a safe alternative to antibiotics. We buy and keep on hand Vibactra as a safe alternative to antibiotics. We buy and keep cranberry supplements to treat and prevent urinary track infections in dogs, cats and humans too. Sadly, not all states will accept medical exemptions. One state even requires that puppies be vaccinated too early, endangering the pup with a shot that will most likely not work because maternal antibodies should still be present. I’m looking into these vendors. You mentioned FreshPet in this article. I am trying to find as much information about this product since my dog got sick, as well a my sister’s dogs 1000 miles away. We are currently in touch with the FDA and they are going to test the food and investigate the situation. But in the meantime – I would like to find as many people as possible, and anyone who understand their ingredient labeling to help me understand what is in the food that could have made my dog so sick. I have been using this product for 3 years and all has been fine – in fact, it has been the one food that has kept my dog stable – but something changed in the latest batches, in particular the last one that caused her, and my sister’s dogs to get very ill. Is there anyone who can give me experience or knowledge on this company? Yes, I encountered a package with moldy food and immediately switched off it. Haven’t gone back since. Fortunately, I spotted the mold before feeding it and avoided any sickness. I also recently opened a can of Holistic Select Lamb Pate Recipe, that had an air pocked with some odd white spots on the food surrounding it, that I couldn’t clearly identify, and after removing the offending portion, stupidly went ahead and fed some of what looked good. One of my dogs threw up 3 times (the other one was fine). I contacted Holistic Select with pictures and they responded that it was likely congealed fat. Why would congealed fat cause her to throw up…3 times? I also mentioned it to the pet shop where I got it and they concurred that it was probably that, but I’m still not convinced. It doesn’t look like fat to me. I still have the can (opened 1/29/16), with the suspicious portion in a plastic container and, oddly enough, after 3-1/2 weeks it still looks the same. I suppose, if it was mold it’d be fairly identifiable by now. I just don’t know what it is, but my husband and I have both noticed that many of the cans have these air pockets in them, although not the white spots. They wouldn’t respond to my question about why that is happening. I’m not sure what to do, as this was the only canned food I could find locally that met my criteria for acceptable ingredients. I’ve been looking into Honest Kitchen’s meatless freeze-dried recipe (so I can add my own), but I can’t figure out how much to feed my two 15-lb dogs. Feeding instructions are always ridiculously over-estimated, but freeze-dried is so light-weight, I can’t really compare it to the kibble or canned food, volume-wise. We’re on a tight budget and I have to figure out cost before I jump in…and locate some local meat sources as well. By the way, is anyone aware of a “Nationwide Class Action Lawsuit Filed Against Pet Food Companies and Retailers For Misleading Consumers Regarding the Contents of Pet Food ” that was filed in 2011? Donna, I use Honest Kitchen for my boy. When I started I went on their site and purchased a few of their sample packs to see what he liked $1.00 each. They have small starter boxes also if you wish. I have a 65 lb Lab mix and he gets about 3/4 of a cup of the LOVE(grain free beef) and I add my own organic meat to it equivalent to approx. 2 drumsticks for his evening meal. You dog is small so you won’t need as much. Because it is lightly freeze dried it puffs up after you add the water. My guy is big so I prepare other food for him also but you wont have to for your little one. Michelle, thanks for sharing the amount you feed, but the weight differential is so great, I doubt that just scaling it down to 15 lbs. would be accurate (it works out to .17 cups). Plus you add additional meat (which would work out to a tad less than a 1/2- drumstick of chicken per dog). I believe the directions call for equal amounts of base mix and meat and, at least to start with, I’d like to follow that. So why don’t you just pick one of the grain free meat mixes? You can still add your own protein also and you can avoid the ingredient that you don’t want. Cost is a major consideration at this point in my life and feeding extra meat that’s different, will add onto the price. Plus, I’d rather try and find something a tad more exotic…which I admit will add to the cost. I just don’t get why they have to include peas in the meat-free versions, if they’re not in the grain-free mixes with meat. Some dogs that did well before the change, ended up being allergic to the peas. There are no peas or celery in the grain free beef. There aren’t any peas or celery in the grain-free fish mix either, but I’d rather be able to rotate the meat sources more often than the boxes would allow and I’d think that it might be a little less costly if I get the meat myself. I just shake my head. I am in Canada and apparently we are no better off than those of you in the states. It is absolutely disgusting that when I open a can of Merrick, I could be feeding my beloved fur babies “rotten or diseased” meat (if you can call it that). Merrick indeed got bought out recently too I believe. In the whole big scheme of things, the big food pet companies only care about their bottom dollar. If a few animals have to die in the process so be it, and “how do they sleep at night?”, fine, they sleep fine, cause they don’t reeeeally care. I would hate to think of planting a “spy” on the inside of these places. I think most of us would vomit at the sight of what goes on and in our pet products. I do believe that that warning label battle can be won, like cigarettes (which are probably better for your pet), I do believe we can accomplish that at least. Then it’s buyer beware. I do really want to thank you Susan for all your hard work. I do know that the information you have can be used the same for us in Canada, as we get a ton of our pet products from the states and they just go out on the shelves, no inspections here either. Our government has policy’s in place too to no avail here. Laws are the laws but if no one is there to enforce the laws then what good are they in the first place?? Home made is the next and only step to avoid “most” of this horrible and disgusting practice of allowing “rotten” meats and diseased meats to be fed to our pets. I am a Canadian pet food manufacturer and I know where every piece of my meat comes from. We only buy human grade meat from trusted suppliers. One supplier per protein, I always know where my meat comes from. I care what goes in the bag, rather than the glitzy advertising that goes on it, my two rescue dogs have to eat it! My staff and I all use the meat I purchase for dog/cat food as we know the quality. My understanding of the Food Safety Modernization Act is that food manufacturers have to be able to trace back their ingredients two steps. Am I wrong? If I’m right why don’t these manufacturer know? Or don’t they ask? Or don’t they care? Or don’t they want to know? I have to wonder if your proposed label change will result in different labels for different countries. The pet food industry will complain that labelling costs will increase because they have to produce separate labels for domestic and foreign use. MERRICK GOT BOUGHT OUT BY PURINA. CASTOR AND POLLUX ALSO GOT BOUGHT OUT..
Canidae got bought out. Year before last too. If you feed kibble or canned pet food to your pets, you are paying a premium for carcinogenic, toxic,manure laden poison. I love my dogs; I just can’t do that to them. Since we switched to human grade ONLY food a year ago, our vet visits are down to once a year for titers, shots, or an owie. I much prefer to spend my money on quality food rather than vet visits (much as I love my vet!). Why pay $2/pound for toxic garbage with manure? We buried our lab/pit bull mix last Friday. And are currently monitoring our lab for any other intestinal problems. I have NO DOUBT in my mind that I poisoned our pets with FreshPet moist chicken roll. I believe it was 3-5 months ago when I started giving them Freshpet. The lab became sick diahrea, fever and developed a fatty tumor under her rear right leg. Had surgery to have it removed, she healed but she was always tried. Smaller dog ( Daisy) then got sick, visit to the vet found 2 tumors also in the rear extremities, lethargic, fever, etc. Placed on antibiotics, 7 days later surgery to remove them. The 1st dog we were lucky, tumor was not malignant. Daisy…..not so lucky, they were cancerous and she never recovered. People may say, oh she had cancer that can’t be the dog food. Of course, many factors can cause cancer just as it does in people. But, the FDA article on research of Freshpet chicken rolls, due to high consistencies of certain ingredients, have caused and can cause cancer in dogs. I wish I would have done my research before feeding it to them. Quite awhle ago I bought some FreshPet & took it home & opened it and it smelled sooooo bad!! I took it right back & demanded my money back. What garbage is in that stuff? Susan, what you did is epic. Truly. This kind of work is tremendously stressful and difficult, as you must check all your facts, read about law, understand politics and animal nutrition…and that is just the short list. I just threw my back out (again!) after doing this marathon session of research into forced labor (slavery), the fishing industry, the laws that govern it and how it relates to the pet food industry. I’ll have to read all the fabulous comments while laying flat on my back! It’s not so bad, because I usually have a cat on my tummy to keep me company and it helps to keep the misery at bay. Plus, I have the deep satisfaction of knowing that I am able to cause the pet food industry just a teensie-bit more pain every day! Thanks for the great reporting, the hard work and the kick in the pants you give to all of us who want to help you do everything we can to change the way the pet food industry is run. You are an inspiration, you motivate me to continue this arduous, but important, work. I sent the letters to my atty general and state representative and senator. Thank you for the samples. If everyone took 10 minutes to do this, more pets will live. I’ve sent mine too! Fingers crossed many, many people will do the same. As individuals we can accomplish nothing about changing this situation. That should be obvious by now. Only when complainers amass large enough numbers does it exert any pressure against profits and corporations and officials. This is an obvious lesson from historical changes that went beyond wishful thinking and dreaming and actually happened in this country. How about national and state associations of veterinarians? They have authority and leverage to speak as a group that will be listened to and whose message will be taken seriously, if it’s factual. Can you back up this website’s claims and convince the vets that there’s a significant problem here? If not, why not? If not this year, then when? Why haven’t the been enlisted by now? This puzzles me. Facebook mobilizations and youtube videos that don’t come across as crank or crackpot or exaggerating often go viral if done well. The popularity of pet videos shows this isn’t a tough topic to attract attention, and not only cute “Awww” stories. One can produce a darn good persuasive tear-jerker five minute video for less than $10K. This website is a good start and we can all complain here and wring our hands for another year but it would help if such a video appears before then — on the national level, you need to expose names and with faces of officials who do not reply to certified mail questions about enforcement. Same with state levels. You only have so many real pressure points and they are not difficult to think of. It shouldn’t be that hard to get names and faces of those at the top of the enforcement chain. And then to get them on camera refusing or delaying interviews. Sixty Minutes in the old days did and local TV stations still do these catch them in public with a camera and confront them. It makes those officials look really bad. Whether govt. or corporations, it is always living breathing individuals who are responsible and who you need to pressure if you sincerely want results. Incidentally, a worthwhile manual for anyone who wants change, especially managers, is Robt. F. Mager’s “Goal Analysis: How to Clarify Your Goals So That You Can Actually Achieve Them.” Apparently, the goal here is enforcement. James – I provided every bit of evidence within this article. But convincing the veterinary world of this is probably futile. With the exception of the Holistic Veterinary Association, the other veterinary organizations are ‘supported by’ or ‘sponsored by’ the large pet food companies that utilize these ingredients. Many Rx pet foods contain these ingredients. There is a veterinarian in Australia that is battling Big Pet Food’s influence over veterinary students right now (Dr. Tom Lonsdale). He’s been outcast by his own veterinary association for it. The connections/ties between pet food manufacturers and veterinary associations are very close. Susan this is awesome! There is no reason we can’t flood the State Govs with letters and even try and get other media coverage. You have always done a lot for us and our pets but this is exactly what we need to get the word out. Thank you so much! I read this list, buy the yearly reports and have bought both books out there from our lovely and intelligent founders, Susan and Dr Cathy. When I had my first Cairn, Buckie, he got supermarket food no lived to be almost nineteen, although I spent thousands in vet care for bad skin problems. My second Cairn, Sophie, got a ultra-premium dog chow with a good reputation and some very convincing literature. She never had a skin problem, looked much better than Buckie and maintained a good weight. When she died, we decided that our dog-owning years were done, as I am handicapped. Fast forward nine years later. I can no longer live without having a dog to help make our house into a home. I start looking around and find this web site. Smugly, I think that I have an Ace in the Sleeve, the kibble I fed Sophie, which did so much for her. Months later, our adoption goes through and Frodo arrives in our home. Strangely, he doesn’t do nearly as well as Sophie had done nine years before. I look at the ingredients and notice some ingredients I hadn’t seen there before. Frodo’s vet tells me that she is totally against homemade foods, as they don’t have enough nutrition to feed even a lazy dog like Frodo. But when he starts getting bad skin from flea allergies, a greasy and smelly coat, and breath that scares little children, I decide that he gets food I wouldn’t mind serving to my people. Frodo has never done better than he’s doing on this diet. When he was diagnosed with diabetes, he looked terrible, din’t want to walk or play; so his vet said he needed Royal Canin Dog food for diabetic dogs. I bought a small bag, and almost gagged when I opened the. He gobbled down the food, but after a few weeks, didn’t seem a lot better. He was catching every dog virus walking by the park. Frighteningly, he couldn’t get a regulated dose of Insulin, and his blood sugar was either much too high or too low. I decided to mix my kind of dog food with thee stinky kibble. Within a week he turned around. He’s also lost whatever excess, got nice breath (for a dog), and had clean skin with shiny fur. I rotate the vegetables by season, but he always gets his favorite, green beans. The Royal Canin gets very little use, and none when I can avoid it. Frodo has the activity of a pup, he bows, dances, and will play us over a chew toy forever. I still write and call my congress people, both state and federal. I’ll sign every pet oriented petition out there, but the chances of it succeeding are slim to none. Our lawmakers are controlled by big money these days, not the people. As I am not big money (or even medium money, for that matter. I don’t care how well you are set for money, having a handicap and recovering from a car accident leaves almost anyone broke.) I know I have no “pull” to make my lawmaker listen to me, but I still try. I don’t see dog food policy changing soon. So I’ll still make his food, and hope he lives past 20! I’m so glad your puppy is better, however. Can u cook 100% raw? I belong to a Facebook group that could help you. Class action lawsuit?? Is it possible for consumers to amass a suit/s against the federal and state governments/agencies for being in violation of and/or not enforcing the laws? Obviously, I’m not a lawyer. It might be a colossal undertaking – what isn’t in the area of truth in pet foods and labels – but perhaps it is an effective way to incite widespread and permanent change. If those in violation of law were held accountable in a more direct and public way ie lawsuit, it might protect more animals and consumers. Even just the publicity of a large class action suit might be convincing enough. Warnings on labels is a helpful step for sure and should be done also but sadly not many people read backside labels on their own food let alone those of their pets’ food (present company excluded of course). Placing the warning on the front side label in bold, clear warning would be awesome. And really, it’s important enough for it to be on the front side. But if the laws are not being enforced by the appropriate agencies, perhaps consumers can hold them accountable in a legal way. Stellar work as always, Susan. Thank you for your efforts! I keep asking the questions…. why over pay congress to keep passing laws (pet food, immigration)? if they are not enforced? why tax us? if Washington can just print and spend dollars with no correlation to anything? it’s the people we elect and send to Washington who are the problem. but I don’t know what to do about the political elite who push to the head of the line. or bought by the highest bidder…. I want to complain loudly about Priority tall cans of cat food. They charge a lot, but it’s mostly water. The most recent one I opened was nothing more than disgusting paste. How can they sell this!!!?? Now I’ve heard it all – I don’t blame you, how pathetic. pls write them & send them these comments & demand something. Cheap liars, they are.